What GPUs are compatible with the Razer Core V2? Graphics cards use varied designs based around a common graphics chip. 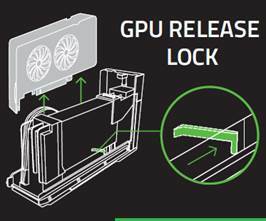 Please ensure that the GPU selected meets all size, power, and additional requirements. What is NEW with the Razer Core V2? Razer Core V2 offers the world's first Thunderbolt™ 3 dual-chipset internal design that allows for data separation of GPU graphics and I/O via a single cable connection to the laptop. This helps ensure even more fluid gameplay when using high bandwidth peripherals and other devices when gaming. We have also redesigned the inside of Razer Core V2 to allow for taller graphics cards to be installed. Especially some of the larger taller NVIDIA GTX 1080 cards. The exterior CNC Aluminum design remains unchanged on the front and sides. Additionaly, we now have compatibility for NVIDIA Quadro workstation cards. Which notebooks are compatible with Razer Core V2? Razer Core V2 currently supports the Razer Blade Stealth, Razer Blade, and Razer Blade Pro (GTX 1060) laptops that have Thunderbolt™ 3. Additional laptops require a Thunderbolt™ 3 port with external graphics support. Please check with your laptop manufacturer to confirm if the laptop supports Thunderbolt™ 3 external graphics. How do I remove the graphics card? The GPU release lever is located under the power supply. Please make sure to use the release lever before removing the card. Removal of the card without unlocking it may cause damage. Why do two(2) Razer Core V2 units show up as attached Thunderbolt™ devices? 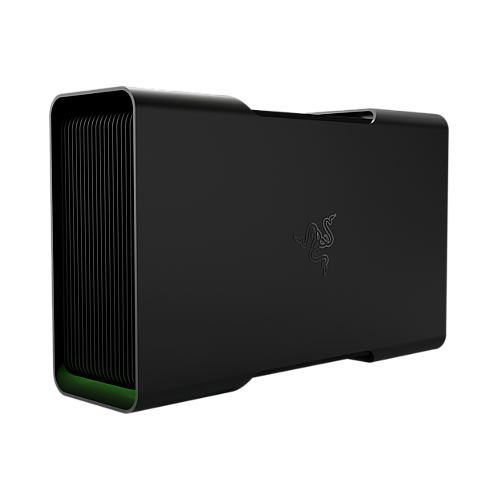 Razer Core V2 features the world's first dual Thunderbolt™ 3 internal chip design. This allows for the separation of graphics and I/O data via the single cable connection to your laptop. One chip is dedicated for graphics and other is for USB and Ethernet. Which GPUs can be used with Razer Core V2? Razer Core V2 supports a wide variety of GPUs from both AMD and NVIDIA. We recommend reviewing the list of compatible plug and play graphics processors. Please ensure the graphics you select meets all power, size, and additional requirements. Older cards may function, but compatibility and driver support may vary. Where can I download graphics drivers for Razer Core V2? You can download the latest stable drivers from NVIDIA or AMD for use with your compatible graphics card. Can I use the Razer Core V2 without installing a graphics card? Yes, the Razer Core V2's I/O ports including USB and Ethernet will continue to function without a graphic card installed. What are the specs of the Razer Core V2? You can find all the specs of Razer core by visiting this page. If you were unable to troubleshoot and resolve any issues you are having with the knowledgebase (FAQ) and you feel your product is still defective, please don’t hesitate to contact us here or call with the phone number for your region at the left.